Former NBA star and Presidential Medal of Freedom recipient Kareem Abdul-Jabbar explores his 50-year friendship with Coach John Wooden, one of the most enduring and meaningful relationships in sports history. When future NBA legend Kareem Abdul-Jabbar was still an 18-year-old high school basketball prospect from New York City named Lew Alcindor, he accepted a scholarship from UCLA largely on the strength of Coach John Wooden's reputation as a winner. It turned out to be the right choice, as Alcindor and his teammates won an unprecedented three NCAA championship titles. But it also marked the beginning of one of the most extraordinary and enduring friendships in the history of sports. In COACH WOODEN AND ME, Abdul-Jabbar reveals the inspirational story of how his bond with John Wooden evolved from a history-making coach-player mentorship into a deep and genuine friendship that transcended sports, shaped the course of both men's lives, and lasted for half a century. COACH WOODEN AND ME is a stirring tribute to the subtle but profound influence that Wooden had on Kareem as a player, and then as a person, as they began to share their cultural, religious, and family values while facing some of life's biggest obstacles. From his first day of practice, when the players were taught the importance of putting on their athletic socks properly; to gradually absorbing the sublime wisdom of Coach Wooden's now famous "Pyramid of Success"; to learning to cope with the ugly racism that confronted black athletes during the turbulent Civil Rights era as well as losing loved ones, Abdul-Jabbar fondly recalls how Coach Wooden's fatherly guidance not only paved the way for his unmatched professional success but also made possible a lifetime of personal fulfillment. Full of intimate, never-before-published details and delivered with the warmth and erudition of a grateful student who has learned his lessons well, COACH WOODEN AND ME is at once a celebration of the unique philosophical outlook of college basketball's most storied coach and a moving testament to the all-conquering power of friendship. Kareem Abdul-Jabbar is the NBA's all-time leading scorer and a six-time NBA champion. He is also one of a handful of influential and respected black men in America who has a national platform as a regular contributing columnist for the Washington Post and TIME, where he shares his thoughts on some of the most socially relevant and politically controversial topics facing our nation today. After 50 years as an athlete, activist, and New York Times bestselling author, he offers his perspectives on how we can work together to solve some of these issues as a nationally recognized speaker who regularly appears on the lecture circuit. His book, Writings on the Wall was just released in Fall 2016 by Time Books and offers his personal perspectives on political issues facing America today. In 2012, Kareem was appointed to be the U.S. Cultural Ambassador by then Secretary of State Hillary Rodham Clinton. Currently he serves as the chairman of his Skyhook Foundation whose mission is to "Give Kids a Shot That Can't be Blocked" by bringing educational opportunities to under-served communities through innovative outdoor environmental learning. Kareem's most recent projects include the HBO Sports documentary, Kareem: Minority of One, which debuted in early November 2015 as HBO's most watched and highest rated sports documentary. His debut novel Mycroft Holmes-a mystery novel and the first of an action/mystery series based on Sherlock Holmes's savvy older brother-was released by Titan Publishing in September 2015. Following the success of his novel, the comic, Mycroft Holmes & the Apocalypse Handbook was developed into a series of 5 comic books. 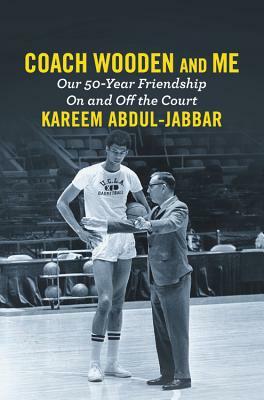 "Abdul-Jabbar and Wooden shared a priceless friendship, and this sensitive, sharply written account brings it to full, vivid life."